degrees into the air but the coil that is providing that heat is far hotter at certain points in the A/C system . Heat that is essentially lost to the air. It appears that that heat is a pretty cheap way to heat up your water. Most Water Heaters in Florida are installed in a pretty warm area of the house - the Garage. Why not heat up your water and maybe slightly cool down and slightly dehumidify the area as a side effect when your water heater is running? The hot water system accounts for a large portion of your electric bill and nearly half of the cost of heating water is lost to the inefficiency of the standard water heater. The case for spending additional money on a heat pump water heater is clearly justified if you intend to stay in your home for a 3 - 7 years or longer and it does create a good selling point if you intend to move soon. With a higher energy rating, this heater is twice as effective at heating the water as a conventional water heater. When you add the possible tax credits available, it could help pay for this heater in a very short time. With credits possible from local and state sources you should talk your tax accountant for other credits and/or rebates available. The Rheem Heat Pump Water Heater has an energy efficiency rating of 2.0. The system has an easy to use LED Touch Pad. On the Touch Pad you will find three different settings, Energy Saver, Normal and Electric Heat. The Energy Saver uses the heat pump technology and the first hour delivery is 67 gallons per hour. On Normal Mode you find that this setting uses the heat pump with a backup heating element and the Electric Mode uses two heating modes. It has the heat pump installed on top of the water heater. The unit has side connections with 3/4″ inch NPT Water Inlet. 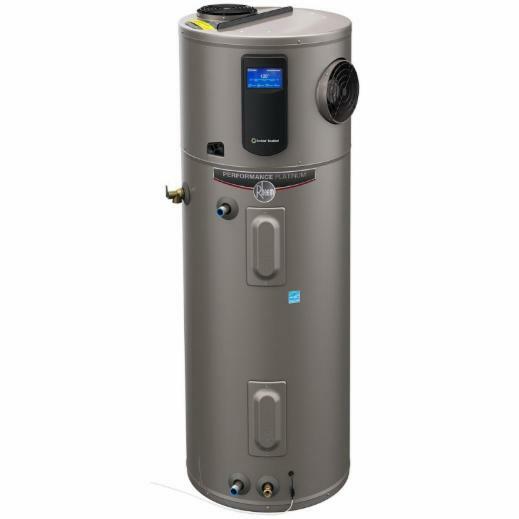 The Rheem Heat Pump Water Heater comes with a 40, 50 Gallon and even 80 gal Tank, insulated with a 2-1/2 inch Non CFC Foam Insulation. There is a factory installed resistored anode rod; this will help prevent corrosion which can shorten the life of your tank. The tank is lined with the Rheem Rheemglas , the unit has a factory installed Temperature and Pressure Valve. The heat pump water heater comes with condensate drain connections.